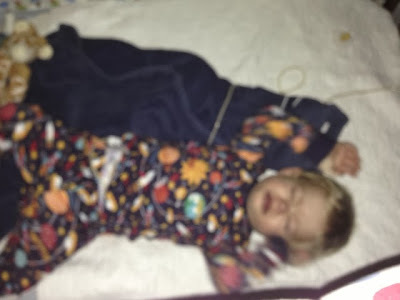 Holden was sedated to get permanent IV line in him. His anesthesiologist even came in to help, ON HIS DAY OFF! Pretty awesome stuff. The angle makes it look like he's picking his nose. Amazing, huh? During his appointment on Monday, Holden's doctors decided it was time for him to be under a little stronger supervision. Unfortunately his heart is struggling a little more than it was a few weeks ago when we were allowed to go home pending transplant. So, we're back in the hospital. While there is no timetable on his release, the goal is to pump the precious heart nectar known as Milrinone through his veins and remove some of the stress from his ticker. If it's successful there is an outside shot he can come home for Christmas. The good news? The fine folks at Shands and Arnold Palmer Hospital agreed to allow Holden to do this in Orlando.So, we don't have to pack the conestoga and head up to Gainesville just yet. The great news? They allowed us to wait until Friday so we could spend Thanksgiving with him. We catered our days to Holden. SeaWorld. Thanksgiving. Yesterday? A trip to Lake Eola to visit the swans. Lunch at Jason's Deli (salad bar, brah). Holden is doing very well right now. This place has all you can eat hummus. Hummus I tell you! Behold the wonderful feast of thanks! A holiday that celebrates everything we love as human beings. Loved ones, life, and cooking with butter. Holden isn't what you'd call an "eater", in fact the rare moments he goes hand to mouth with any sort of foodstuffs calls for its very own balloon filled Macy's Parade. He ate a little, but we made sure to consume his complete share of the turkey and sides. 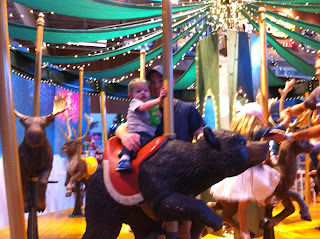 With dad off for the Thanksgiving holiday, we went to SeaWorld yesterday. Earlier this year we acquired annual passes, which is nice, because the attention span of a two year old can best be described as "limited". (2) The Polar Express ride was really cool, but of course we didn't take a single picture of any of that. (3) Holden tried touching the penguins, which is frowned upon, apparently. 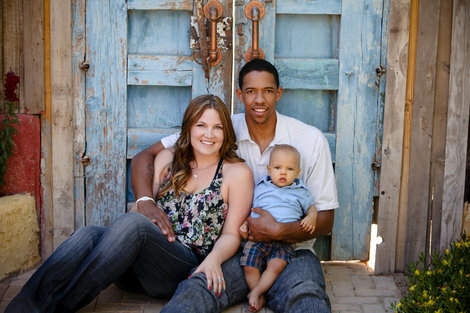 Check out this interview on Life of Dad with NBA player Channing Frye. He was born with a CHD and talks about his experience, along with his work to create awareness. Pretty cool stuff. Special thanks to Grandpa Andy who accompanied Holden and Nicole to Gainesville for his checkup! Unfortunately the Thanksgiving holiday really put a wrench into the week, and dad couldn't join in. Pictures with Santa take 2. The Central Florida Gator Club hosted a holiday shopping event on Sunday that included a Gator themed Santa scene. Holden summed up the entire football season in 30 wonderful seconds. Santa hung in there. What a trooper. College football is a big deal in our household. It is that way because I was raised on the idea that every Saturday in the fall is Christmas morning. We were lucky enough to spend Saturday at my parent's house for slew of games. Smoked ham, Mac n' cheese, and green beans to boot. My dad even gave up his Lazy-Boy for Holden. Holden has had well documented issues when it comes to gaining weight. Luckily modern medicine has helped us address those problems. These days he eats, but his favorite foods are all healthy. Take these photos as an example, the kid rejected cheese puffs, cookies, ice cream, and a butter-lard sandwich in favor of this here segment of cucumber. Tommy Riles and the crew from Life of Dad put together this Thanksgiving video featuring several young CHD survivors. It's always amazing to see these kids understand the gift the medical professionals have given them. Check it out! A few months ago we purchased one of those bike carriages for Holden. The idea was awesome. We'd all pack up and go on a bunch of magical Sunday family bike rides to the Lake Eola Farmer's Market. The excursions would allow us to stock our pantry with local, organic healthy goods. Of course, Mom and Dad would be all in shape as a result. Almost hours after we purchased the carriage, I took my new, used bike for it's first spin. After parking it outside of my cousin's house for the better part of 5 minutes, it was gone. Bikes don't last long on the thievery market. If you'll ignore the obvious brochure conspicuous text safety violation he had a lot of fun as we took turns on Nicole's pink beach cruiser. Nicole wore sandals on the bike? She's always told me that is a no-no! 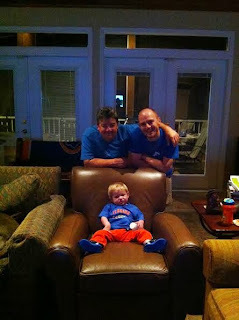 We are alumni, and unbelievably diehard, loyal fans of the University of Florida. As a result we force our child to join the fray. 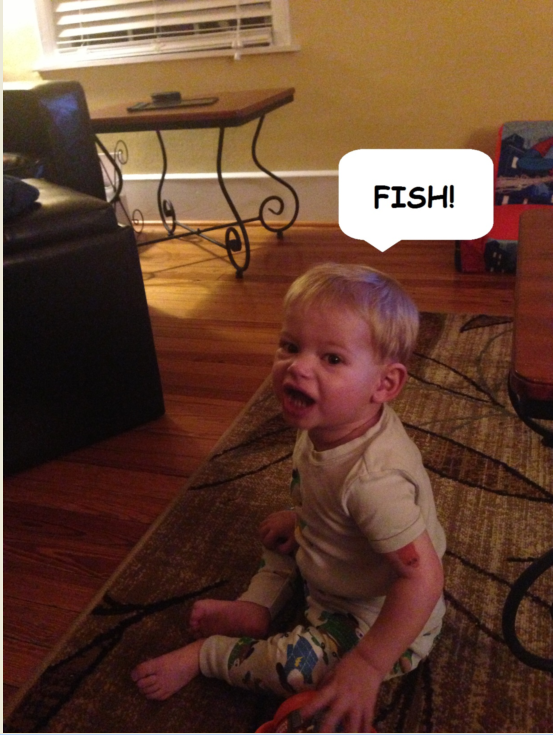 We force clothes on him, teach him the various cheers (specifically "The Chomp"), and tell him all about the days of yore. Sadly, for the first time since daddy's birth year (1979) our football team is probably going to have a losing record. It was said last weekend, while the University of Florida doesn't field a great football team in 2013, they do field one heck of a pediatric heart transplant team. Gainesville check-up #1 of ??? 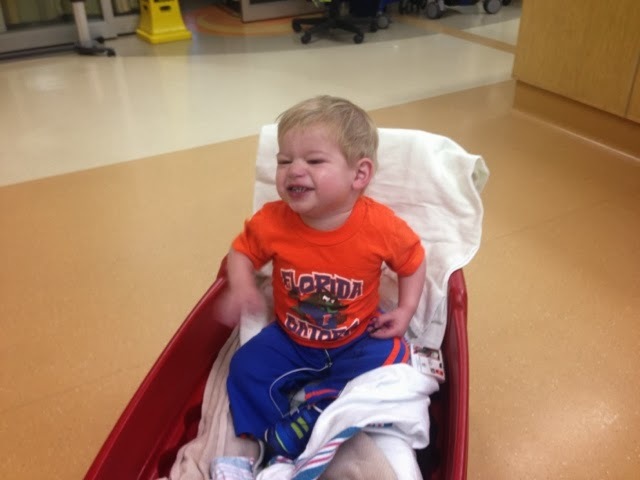 As part of Holden's pre-transplant release we have to make our way up to Gainesville for bi-weekly check ups. (It's a little over an hour, and it has Burrito Bros. No complaints) The usually uncooperative Holden surprisingly held still for both his echo and EKG making the trip a lot shorter than we ever expected. Clearly a sign of maturity. 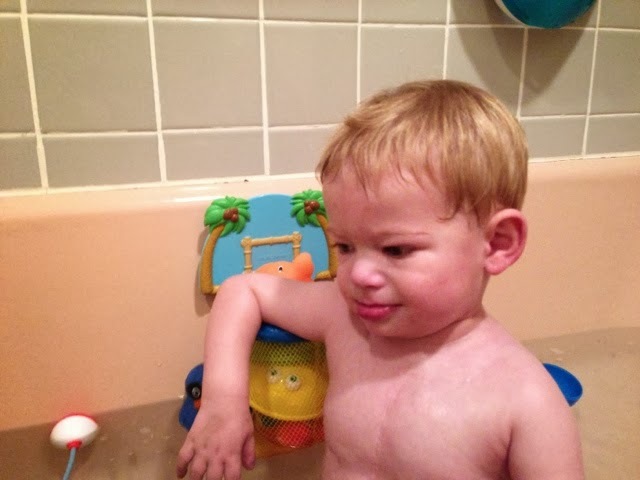 One of the CHD transplant stories we've been following is Owen (Here is a link to his story). It's a great follow, as he was a kid who was in somewhat of a similar situation as Holden. He received his new heart on July 17th, and came home relatively quickly. OH THE HUMANITY! We knew this day was coming, we just had never prepared ourselves. In fact, it was one of those moments where you throw your head into the sand and ignore the cruel reality. It's easier that way. Why pull hair over a future problem when it's not an issue NOW? If you'll recall, after Holden inadvertently stumbled upon AT&T U-Verse's fish based advertising channel he was absolutely obsessed. At least once a day we'd deal with something like this. My office was closed for the Veteran's Day holiday. (Happy Veteran's Day to Holden's cardiologist at that). I took advantage of the time off and joined Nicole and Holden at his speech therapy session in the morning. Afterward, we took him to the park to butter him up before using our size advantage to force him to join us on a jaunt to the outlet mall for some fashionable outerwear. 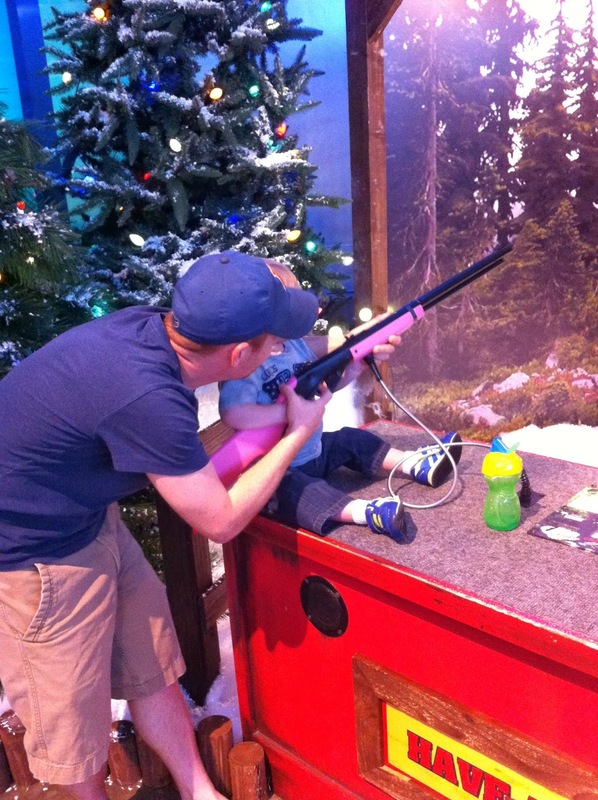 Bass Pro Shops isn't a store, it's a freaking test. Not that I go in and spend all my money on a trolling motor or anything, it's just so large you can easily get lost. Dare I call it a southern IKEA? Holden seemed to enjoy the idea of a mid-November's Yule, so we obliged. The pictures are below. After debate (Swinging around the carousel 3 times, and declaring "no" to every available Bass Pro Shoppy-like creature), Holden settled on the bear. I've yet to see any human being actually tame and saddle up a bear. It would be kind of silly, seeing as cartoons taught me bears have two interests in life and neither of them involve extensive and labored travel. Holden's physical therapist would be so proud. Of course, no mid-November Christmas is complete without a photograph with Ol' Saint Nick. We weren't expecting such a meeting so Holden's attire can best be described as tattered. He met Santa with the patience of a starved puppy, and of course the camera lady erred in her first shot (was told it was a picture of the ground, and half-a-Holden). The reshoot required some talent, thus the reason I am photobombing to the left. There is juice in that cup, and Holden would probably let you know if you were there. There have been a lot of resources that we've turned to since learning about Holden's transplant needs. This is one that is something we've looked back to and really appreciated. You can check out their blog here. 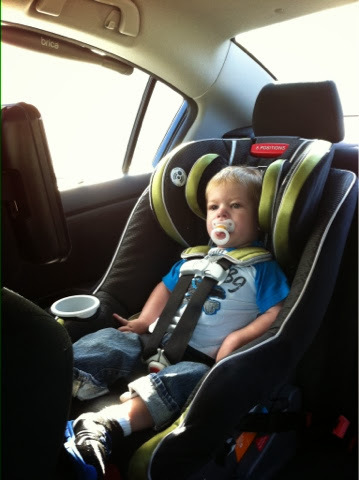 We've slowly been teaching Holden the right and wrong way to drive his automo-toy. For example, he just can't ride the gas when he's hit a wall. The automo-toy, while well constructed, doesn't possess the ability to drill its plastic frame through concrete. His biggest issue is acceleration and braking. It's getting better, but still a bit jagged. Think robo-cart on a crowded aisle at Publix (or watch the video below). It's okay for mom and dad to go PowerLite at Tijuana Flats, right? Holden still digs it. Last night, was the first meeting since we've announced Holden's need for transplant. We were fortunate enough to be joined by the American Heart Association of Greater Orlando and adult CHD survivor Amanda Jean who shared her own story. I know the doctors and nurses are great at giving incite, but nothing beats the war stories like hearing it from the soldier themselves. If you're a CHD survivor, parent, doctor, nurse, or support staff, join us sometime. We have refreshments! MMMmmm...refreshments! Holden demonstrates how to wait for a heart. Holden made his return to the Orlando cardiologist today. When we last visited two weeks ago, we left believing that he would be staying in Gainesville for awhile and said our appropriate and emotional temporary good-byes. Well surprise, surprise when Holden came strolling into the office as if he'd just taken a mediocre two week sight-seeing vacation to Delaware. It was absolutely amazing to hear everyone has been following his Facebook page and reading this blog. We always said we've been blessed to have so many great people showing us support throughout all of this. That group includes our family of doctors, nurses, and support staff at The Heart Center and the Pediatric Cardiology ICU at Arnold Palmer Hospital. 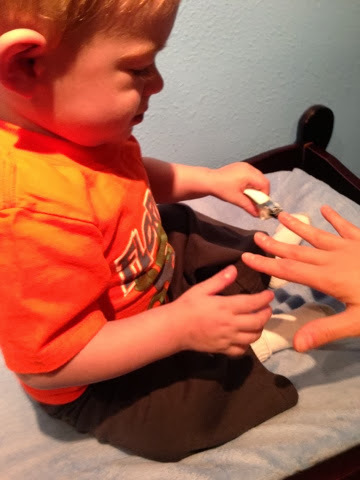 Holden might not enjoy the pulse ox readings, the weight checks, and he definitely wouldn't choose to partake in an EKG reading, but I know he feels comfortable around everyone over there. They make things really easy on him. Thank you! And while you're at it, take a look at this picture of Holden next to our mosquito hive. Holden took his first ride on the always sleek and sophisticated 6 volt Batman automovehicle today. We tend to bite our nails during Gator football games. Holden assisted us in assuring that doesn't happen. 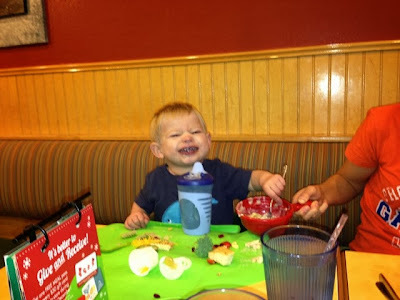 We haven't figured it out "why" yet, but Holden only likes to eat at joints that feature a salad bar. Home? Won't eat. Another person's house? I blame their cooking. A classy joint like a Ruth's Chris or a Captain D's? We don't even order for him anymore. Throw a 20 feet long brass laden serving bar equipped with a sneeze guard in any of those places? He'll take on Joey Chestnut. We took him to Sweet Tomatoes tonight just to watch him eat. The picture speaks for itself.